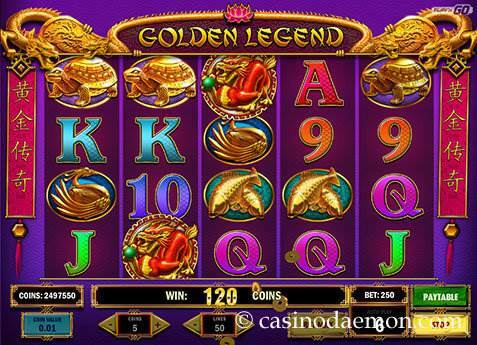 A slot with traditional Chinese symbols and ornaments is Golden Legend from Play'n GO. This game has symbols with dragons, lions, koi fish, and many other thematic symbols. The game, music and sound effects are in perfect harmony, and you will feel the tranquil yet thrilling atmosphere. The slot offers some interesting free spins with stacked wilds and great wins, and it's worth checking it out. The variance is medium, as there will be lots of rounds with smaller or no wins, but once you make it to the free spins you will be rewarded for your patience. The game should be played for a while, as the free spins offer the highest chances for a good win. The theoretical return to player is 96.5%, which is average for an online slot. You can also play Golden Legend mobile on devices that support HTML5 games. 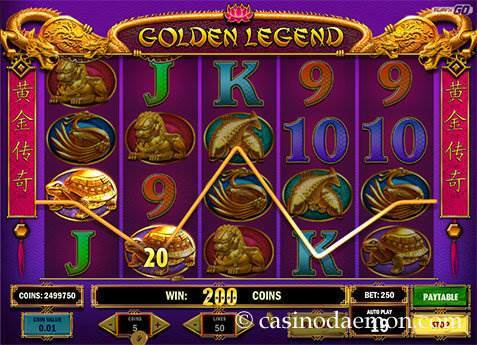 You can play the demo version of Golden Legend for free here, and if you like the game you can also play it at one of the online casinos mentioned on this page. 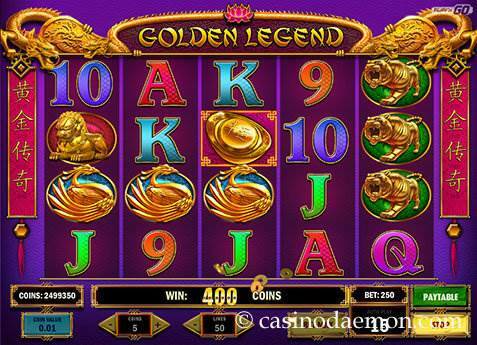 The slot Golden Legend has a wild symbol that replaces other symbols for the highest paying combination, but it doesn't replace the symbol that triggers the free spins. The scatter symbol pays out when you get at least 3 of them on the screen, and you will also start 10 free spins. In these free spins, you will get two stacked wild symbols, greatly increasing your chances for a big win. You can also re-tigger the free spins once, up to a maximum of 20 spins. In the free spins you can win up to 1 million coins, simply because of the stacked wild symbols and the superb winnings they offer. You can also gamble the winnings from a normal game round. The gamble button appears after you've had a win, and you can decide to play this risky game with the chance to double or quadruple your winnings. Guess the correct card colour red or black for a 50% chance for a x2 payout, or guess the correct card suit (spade, clubs, diamond, heart) for a 25% chance for a x4 payout of your winnings. Remember, that you will loose your stake in case you guess wrong. 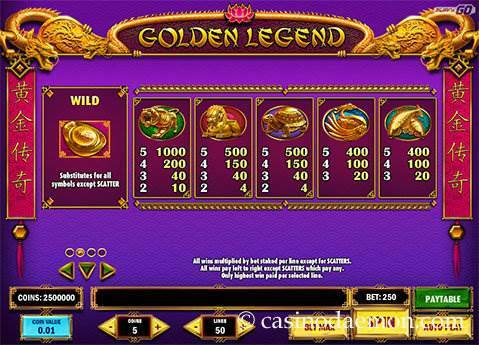 Golden Legend from Play'n GO is a 5-reel slot with 50 pay-lines that can be selected individually. Coin values range from 0.01 up to 0.40 £/$/€, and you can play up to 5 coins per line. The minimum stake is 0.01 £/$/€ and the maximum you can play is up to 100 £/$/€ in one spin. You can also select automatic play for up to 50 rounds with advanced stopping options.